This page on Wing Chun stances was written by WingChunLife.com reader, Chris. He did a great job clarifying some points and sharing his personal experience training with Grandmaster Ip Chun (Ip Man's son) and his students. Wing Chun differs massively between lineages, so it really depends who is teaching you. What I can tell you is what Si Gung Ip Chun [Grandmaster Ip Chun, Ip Man's son] teaches, as I have been trained by his students and have visited his kwoon in Hong Kong. Yee Gee Kim Yuen Ma is a training stance used to strengthen the legs. In practical training it, or any version of it, should not be used. From Yee Gee Kim Yueng Ma, turn your left foot outwards so it is parallel with your right foot. Transfer about 70% of your weight onto your right foot. Twist your hips 45 degrees to the left, and face your shoulders fully 90 degrees to your left (so you started off looking forward, and now you are looking to your left - your right foot is your back foot). You can now push forward with your back foot to move forwards, or lift up your back foot momentarily and allow your weight to move you backwards. You can turn your back foot out a little more to get some extra sideways stability. This stance is used to quickly close a gap between you and an opponent. In Biu Ma, the practitioner can move forward quickly to gain physical contact with the opponent using either a Mun Sau or by lifting the front leg to perform a kick. Biu Ma can also be used to apply pressure by pushing from the back leg during a Po Pie (double palm) or to absorb pressure coming from directly in front by using a Lan Sau (Bar arm). From Yee Gee Kim Yueng Ma, turn out both of the feet so they are slightly less than 90 degrees. keep a slight bend on the knees. In order to step forward, the practitioner must first turn his left foot out by about 20 degrees, and then move his right foot forward, keeping it facing forward. In order to step backwards, just complete these movements in reverse. This stance should be moved once physical contact has been made with the opponent. It is the stance used during Pun Sau (the rolling part of Chi Sau). From Sarm Bok Ma, turn both your feet (on your heels) at the same time to point 45 degrees to the left. At the same time, transfer 70% of your weight to your right leg. Your hips and shoulders should turn 45 degrees to the left. Drop down so that both your knees are bent. All this should be done as one swift motion. 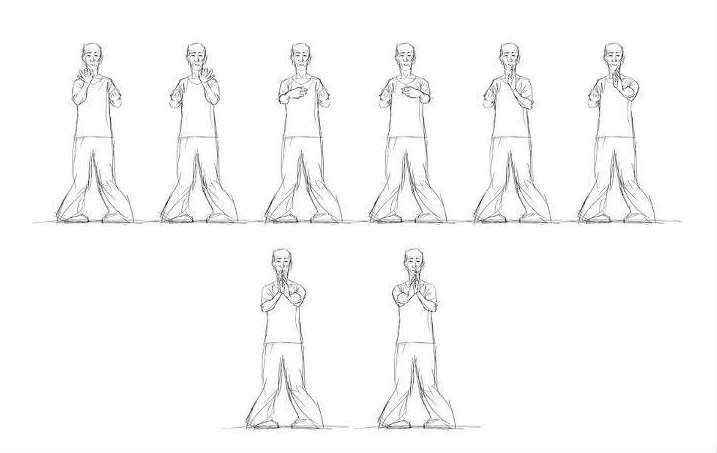 If you stand facing a wall and put your fist out so it is touching the wall directly in front of your face, and then turn into the Cheun Ma stance, your fist will remain in the same place but your whole body will have rotated around the point at the end of your fist, so that you are now facing it at a 45 degree angle. This stance is used to quickly change the angle of attack by moving round the opponent opening up new gaps in their defence. The twisting motion also utilises the entire bodyweight to put momentum into a strike. The stance can also be used to absorb force applied to the practitioner through a position (eg. Jum Sau - sinking elbow) performed with what would otherwise be the striking hand. Of course, there are a few more turns and shuffles involved in the footwork of Wing Chun, not to mention the Heun Ma techniques in Biu Jee, but these are the basics. As I said, there are many other practitioners of Wing Chun that train their footwork differently; the most notable being the Leung Ting lineage who turn on the ball of their foot instead of their heels. I'm not trying to criticise anyone. Each to their own. This is just what I've been taught by Ip Chun and his students. Chris, that was excellent. Thank you. I'll just add that the William Chueng lineage steps rather than pivots. They pick up their feet off the ground and step, rather than pivoting on the heel or the ball of the foot. > > How about you? How does your lineage teach footwork and Wing Chun stances? Comment below.